The Calais Jungle was a refugee and migrant encampment in the vicinity of Calais, France, in use from January 2015 to October 2016. This camp was an example of the issue of migrants around Calais, who attempt to enter the United Kingdom via the Port of Calais or the Channel Tunnel by stowing away on lorries, ferries, cars, or trains travelling to the UK. The camp gained global attention during the peak of the European migrant crisis in 2015 when the population of the camp rapidly grew and French authorities began carrying out evictions. Some 6,400 migrants were removed from the encampment in 170 buses in October 2016, with the intent of resettling them in different regions of France. On 26 October 2016, French authorities announced that the camp had been cleared. In July 2017, Human Rights Watch published a report called "Like Living in Hell" documenting what it described as continuing human rights abuses by the police against children and adult migrants in the region. This issue has lasted for two decades. When the weather is clear, it is possible to see the British coast some 33 kilometres away, giving the illusion of a close proximity of the UK. There have been various "jungle" camps around Calais since 1999, where illegal migrants would set up camp on unoccupied land, and moving to new locations around the town once they would be closed down by the French authorities. At the same time, other migrants squat in abandoned buildings. In April 2015, The Guardian reported that the "official" and principal "jungle" in Calais was located at a former landfill site, five kilometres (three miles) from the centre of town, and occupied by 1,000 of the 6,000 migrants in Calais. According to the paper, it was one of nine camps then existing in Calais. This jungle for the first time had showers, electricity and toilets, plus one hot meal served per day, but without proper accommodation. Conditions in the other camps were poor, typically without proper sanitary or washing facilities, and accommodation consisting of tents and improvised shelters. Food was supplied by charity kitchens. The French authorities have faced a dilemma of addressing humanitarian needs without attracting additional migrants. The jungle was located in a Seveso zone (regulated by Directive 82/501/EC). To solve this issue, government action was guided by the Treaty of Le Touquet of 4 February 2003, signed by former French president Nicolas Sarkozy, committing to halt illegal immigration to the United Kingdom via Calais. The camp was estimated to have around 4,000 occupants in October 2015. Almost all were living in temporary shelters like these. A reception facility named Sangatte, opened and administered by the French Red Cross, was established near the Port of Calais in 1999 but rapidly became overcrowded. The original "jungle" was established in the woods around the Port after Sangatte was closed in November 2002 by Nicolas Sarkozy, then the French Minister of the Interior. In an April 2009 raid on a migrant camp, the French authorities had arrested 190 people and used bulldozers to destroy tents, but by July 2009 a new camp was established which the BBC estimated had 800 inhabitants. In a dawn raid in September 2009, the French authorities closed down a camp occupied by 700–800 migrants and detained 276 people. The mayor of Calais, Natacha Bouchart, threatened in September 2014 to block the port because, although it was an illegal action and would bring down upon her lawsuits and opprobrium, she thought it would send a "strong message" to the UK authorities. Also in September 2014, The Guardian estimated that there were 1,300 migrants in Calais, mostly from Eritrea, Somalia and Syria, and in July 2015, The Telegraph reported that the current jungle had 3,000 inhabitants. As of November 2015, there were an estimated 6,000 migrants living in the jungle. 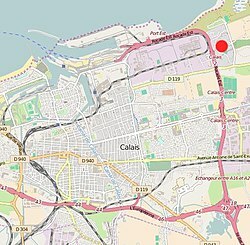 At the end of February 2016, the BBC noted: "[the] Total camp population is disputed - Calais officials say it houses 3,700, while Help Refugees puts it at 5,497". In January 2016, French authorities opened a shelter in the northeastern part of the camp. Authorities had earlier cleared tents and shacks from this area and erected 125 metal shipping containers in their place, converting the containers into shelters for up to 1,500 migrants. Shipping containers, rather than more permanent structures, were chosen because the sand dunes are unfit for permanent foundations. The container shelters were painted white and were furnished with bunk beds, windows, and heaters, but no running water or sanitary facilities (toilets and showers were made available at an existing nearby facility). At the time, Reuters described the "Jungle" as "squalid" and "unsanitary" and estimated its total population to be 4,000. Many migrants subsequently moved into the container housing, but some resisted the French's government ultimatum to leave the Jungle and go to the container area, citing the area's spartan setup, lack of communal areas, and fears that once in the new housing area, they will be blocked from going to Britain. On 25 February 2016, the French government received approval from a court in Lille to evict 1,000 migrants from the camp; the group Help Refugees estimated that 3,455 refugees were living in the eviction area. During the evictions the southern side of the camp was demolished. There was some resistance; riot police used tear gas and stones were thrown. At least 12 huts were set on fire. In March 2016, French Minister of the Economy Emmanuel Macron warned that should the UK vote to leave the EU in its June 2016 referendum, the juxtaposed controls arrangements that allow British immigration officials to operate in Calais might be threatened, and that as a consequence the Calais jungle might transfer to Britain. In February 2016, a petition by charities to stop a planned demolition of the southern half of the "Jungle" camp was rejected by a French court. In early March 2016, workers under heavy police guard began to demolish shacks in the encampment; police clashed with migrants and British activists of the "No Borders" group, who set fire to structures. Three "No Borders" members and one migrant were arrested. As of March 2016, local authorities estimate the population of the camp at 3,700 (of whom about 800 to 1,000 would be affected by the eviction); aid groups put the number higher, saying that according to a census conducted by them, there were "at least 3,450 people in the southern part alone, including 300 unaccompanied children." In late May 2016, a "massive brawl" with unclear causes broke out at the "Jungle" encampment, resulting in 40 injuries (33 migrants, 5 aid workers, and 2 police officers), of which 3 were serious (including a stabbing). Two hundred police officers, seventy firefighters, and eleven ambulances responded to the scene; French authorities opened an investigation. At the time, Deutsche Welle estimated that 4,000 to 5,000 people lived in the camp. As of October 2016, Help Refugees put the number at 8,143. and a subsequent academic article estimated that the population reached 10,000 before the camp's demolition. In September 2016, workers began building a barrier, dubbed "The Great Wall Of Calais", to block refugees from accessing a highway where they could stow away on vehicles bound for Britain. On 26 October 2016 the prefect of Pas-de-Calais, Fabienne Buccio, announced that the camp had been cleared. About 6,000 migrants were bussed to temporary reception centres, while many others relocated to a camp in Grande-Synthe or to informal settlements near the ports of northern France. Aid groups reported that thousands of former Calais residents moved to the streets of Paris. According to a July 2016 census by Help Refugees, the camp was populated by 7,307 migrants - the highest number to date. Of those, 761 were minors according to the census. The population of the camp grew by 50 people a day on average. It has been stated that the population had surged to nearly 10,000 after the Brexit vote on 23 June 2016. Sixty two percent of the migrants in Calais are young men with an average age of 33 and of non-European origin. The mix of nationalities has changed over time, with Kurdish Iraqis being the largest group initially, but by 2014 a growing number of people were also from the Horn of Africa and Sudan. Many of the Kurdish Iraqis later moved to similar camps near Calais and Dunkirk. Most of the refugees do not speak French, and are attempting to enter the British labour market to work illegally rather than claim asylum in France, although the number claiming asylum has risen since the procedures were revised in 2014. Many migrants have paid smugglers to get them to Calais: one migrant from Egypt, a politics graduate, told The Guardian that he "paid $3,000 to leave Egypt, risked my life on a boat to Italy spending days at sea" and that in one month he had tried 20 times to reach England; another, an Eritrean woman with a one-year-old child, had paid £1,825 – and her husband the same – to sail to Italy, but her husband had drowned during the journey. Migrants risk their lives when they try to climb aboard or travel on lorries, occasionally falling off and breaking bones; some fatalities en route are also recorded. The camps themselves are also dangerous, particularly for women, with a volatile mix of desperate young men of different nationalities, drinking, and violence. The juxtaposition of the shanty town and the developed world was stark: according to Médecins Sans Frontières there was some access to water including some showers (sometimes after up to six hours queuing), some food was distributed, and heat was available during cold weather, but sanitation was poor and there were issues of water quality. Care services were offered by Médecins du Monde and Médecins Sans Frontières and, according to UK charity Human Relief Foundation, the migrant population was generally healthy. St. Michaels Church, (also known as The Eritrean Church, or Ethiopian Church) in the migrant camp. It is one of the most recognisable religious buildings in the camp, and one of the earliest community constructed structures, built in April 2015. The church was one of the first substantial community structures, beyond rudimentary shelter, that allowed some of the first congregations in the community. The church was featured on the BBC's Songs of Praise in August 2015. The growth of the refugee settlement has occurred at the same time as: a rise in the popularity of right-wing French groups like the National Front, terrorist attacks in France by radical Jihadists, the Great Recession, and the European migration crisis. Local protests by both pro and anti-immigration groups have taken place in Calais and physical and verbal attacks against residents of the camp and persons thought to be residents of the camp have been regularly reported. Buildings at the camp have also been subjected to arson attacks. Local shop owners have also allegedly discriminated against persons based on their perceived race by forbidding these persons from shopping at their shops. ^ a b c "Calais 'Jungle' cleared of migrants, French prefect says". BBC News. 26 October 2016. ^ "Learning from the Jungle". The Economist. 8 August 2015. Retrieved 28 December 2015. ^ Baumard, Maryline (21 October 2016). "" Jungle " de Calais : le démantèlement débutera lundi à l'aube" [Calais "Jungle": the dismantling will begin Monday at dawn]. Le Monde.fr (in French). Retrieved 23 October 2016. ^ a b "kernel (1) - Ministère de l'Intérieur" (PDF) (in French). Interieur.gouv.fr. Retrieved 11 October 2018. ^ a b c d 'At night it's like a horror movie' – inside Calais's official shantytown. Angelique Chrisafis, The Guardian, 6 April 2015. Retrieved 24 June 2015. ^ a b c d e Migrant squalor in Calais 'jungle'. Emma-Jane Kirby, BBC News, 2 July 2009. Retrieved 24 June 2015. ^ "La " jungle " de Calais est majoritairement située en zone Seveso" [The Calais "jungle" is mostly situated in the Seveso zone]. Le Monde.fr. 19 October 2015 – via Le Monde. ^ "What is Britain doing to help the Calais migrant crisis? - France 24". 21 October 2015. ^ a b Melodie Bouchaud, Remembering Sangatte, France's Notorious Refugee Camp, VICE News (4 November 2014). ^ a b c d e Calais mayor threatens to block port if UK fails to help deal with migrants. Natacha Bouchart, The Guardian, 3 September 2014. Retrieved 1 July 2015. ^ Dawn raid on Calais "Jungle". Archived 23 September 2015 at the Wayback Machine The Connexion, 22 September 2009. Retrieved 24 June 2015. ^ French police round up 200 migrants in Calais swoop. Agence France-Presse, 21 April 2009. Retrieved 24 June 2015. ^ Calais crisis: Bicycle repair shops, mosques and an Orthodox church - the town where migrants wait to cross to Britain. Rory Mulholland, The Telegraph, 5 July 2015. Retrieved 22 July 2015. ^ "France has less and less influence in the EU, and fears to use what it still has". The Economist. 7 November 2015. Retrieved 7 November 2015. ^ "EU migrant crisis: Clashes as France clears Calais 'Jungle'". BBC News. 29 February 2016. ^ a b c d Matthias Blamont, Migrant shelter made of shipping containers opens in France's Calais, Reuters (11 January 2016). ^ Sarah Elzas, Calais Jungle to be demolished, yet migrants resist government rehousing, Radio France Internationale (22 February 2016). ^ Patrick Kingsley, Calais 'Jungle' residents defy bulldozers as police issue ultimatum to leave, The Guardian (12 January 2016). ^ "Calais 'Jungle' eviction gets go-ahead". BBC News Online. 25 February 2016. Retrieved 25 February 2016. ^ "EU migrant crisis: Clashes as France clears Calais 'Jungle'". 29 February 2016. Retrieved 29 February 2016. ^ "Brexit Could Bring Calais 'Jungle' To Britain". Sky News. 3 March 2016. Retrieved 4 March 2016. ^ Wintour, Patrick; Asthana, Anushka (3 March 2016). "French minister: Brexit would threaten Calais border arrangement". The Guardian. Retrieved 4 March 2016. ^ a b c d Clashes as authorities dismantle Calais 'Jungle', France24 (3 March 2016). ^ a b c Dozens injured at fight at Calais 'Jungle' migrant camp, Deutsche Welle (27 May 2016). ^ Davies, Thom; Isakjee, Arshad; Dhesi, Surindar (1 January 2017). "Violent Inaction: The Necropolitical Experience of Refugees in Europe". Antipode. 49 (5): 1263–1284. doi:10.1111/anti.12325. ISSN 1467-8330. ^ "Great Wall Of Calais: Work begins on barrier to stop migrants". ^ Gentleman, Amelia (5 November 2016). "Refugees take to hiding in northern France after Calais camp demolished". The Guardian – via www.theguardian.com. ^ Buchanan, Elsa (21 July 2016). "Migrant crisis: A record 7,300 people now live in Calais' Jungle migrant camp". Retrieved 24 October 2016. ^ "Calais capers: Threats to move Britain's border back from Calais to Dover are mostly empty". The Economist. 3 September 2016. Retrieved 3 September 2016. ^ "Accès aux soins: Médecins du Monde alerte sur la situation des migrants". nordeclair.fr. ^ a b "Nothelfer bauen Lager in Frankreich - Europa - DW.COM - 18.02.2016". Deutsche Welle. ^ a b Malm, Sara (5 January 2016). "The unknown refugee camp 'far worse than the Calais jungle'". Daily Mail. Retrieved 24 October 2016. ^ Calais 'Jungle': Migrants hit dead end in journey to UK Fergal Keane, BBC News, 9 October 2014. Retrieved 24 June 2015. ^ Cooper, Yvette (7 January 2016). "The most shocking thing about Calais is that it's not even too big to solve". The Guardian – via The Guardian. ^ "France: Where refugees go to avoid 'the jungle'". Al Jazeera. ^ Tzermias, Nikos (16 February 2016). "Neuer Migranten-Dschungel: Elend zur Abschreckung" (in German) – via NZZ. ^ "Kein Slum, das Flüchtlingslager ist eine offene Müllhalde" [Not a slum, the refugee camp is an open landfill] (in German). Aargauer Zeitung. Retrieved 24 October 2015. ^ a b c "Calais, la jungle, une médecin mayennaise témoigne" [Calais, the jungle, a Mayennais doctor bears witness]. La Mayenne, on adore !. 19 October 2015. Archived from the original on 20 October 2015. Retrieved 24 October 2015. ^ Taylor, Matthew; Grandjean, Guy (23 December 2014). "At least 15 migrants died in 'shameful' Calais conditions in 2014". The Guardian. Retrieved 2 July 2015. ^ "UK charity considers cutting off aid for the 'Jungle'". 2015-10-06. ^ "Couple overwhelmed by Calais donations". BBC News. 6 September 2015. Retrieved 20 May 2018. ^ Alwakeel, Ramzy (6 September 2015). "CalAid: Hundreds descend on Dalston social centre to donate goods for Calais refugees". London Evening Standard. Retrieved 20 May 2018. ^ Wall, Imogen (9 September 2015). "Amateur aid: The limits of good intentions". IRIN. Retrieved 20 May 2018. ^ "Ecole Laique du Chemin des dunes". Facebook. Retrieved 26 February 2016. ^ Fraser, Giles (2015-08-07). "The migrants' church in Calais is a place of raw prayer and defiant hope". The Guardian. Retrieved 25 July 2016. ^ Hayden, Sally (2016-02-01). "Church and Mosque Bulldozed in Calais Jungle Refugee Camp". Retrieved 25 July 2016. ^ Ahmed, Aaqil (2015-08-14). "Why Songs of Praise is visiting the migrant camp in Calais". BBC. Retrieved 25 July 2016. ^ Jessica Elgot (8 August 2015). "Church of England defends Songs of Praise filmed in Calais migrant camp". The Guardian. Retrieved 11 October 2018. ^ "Inside the Calais migrants' church – in pictures". The Guardian. 2015-08-04. Retrieved 11 October 2018. ^ a b "Introduction to Calais / Introduction a Calais | Calais Migrant Solidarity". Calaismigrantsolidarity.wordpress.com. 13 October 2016. Retrieved 24 October 2016. Wikimedia Commons has media related to Calais jungle. Video of the Jungle in 2009. This page was last edited on 12 April 2019, at 21:20 (UTC).